The art of six-stringer shredding has unquestionably come back to forefront in modern day hard rock and heavy metal music. 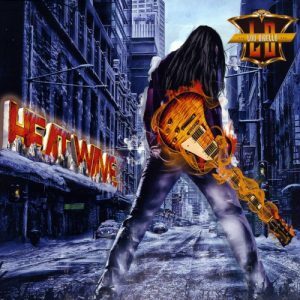 And talented guitarist Lou DiBello will soon be leaving his own mark on the genre, with the release of his album, Heat Wave. The album features input from current or former members of MANOWAR (guitarist Ross “The Boss” Friedman) and SYMPHONY X (bassist Mike Lepond), and is chockfull of headbanging rockers and six-string showcases, especially the tune “Full Throttle” which can be sampled below. DiBello - who is an honors graduate from Musician’s Institute in Hollywood, California - has been a veteran of the Central Illinois music scene since the late ‘80s. Additionally, he has played over 2,500 paid performances, 600 in last 5 years alone, plus countless opening slots for acts like .38 SPECIAL, SLAUGHTER, LA GUNS, MOLLY HATCHET, FOGHAT, QUIET RIOT, SURVIVOR, BLACK CROWES, BLUE OYSTER CULT, and more. As an instructor, DiBello has given over 25,000 private lessons, and started one of the first streaming guitar lesson websites." "Let Me Hear You Scream - Rock & Roll!"